The new Google+ social networking service will be supported by an official App Store application that has already been submitted to Apple for approval. Erica Joy, a support technician at Google, revealed this week that the official Google+ iPhone application was submitted to the App Store. She said that the software was sent for review sometime prior to this week, and is currently awaiting approval. In a follow-up comment, she seemed to suggest that the software could be a universal application, supporting both the iPhone and the larger 9.7-inch display of the iPad. However, she stopped short of specifically saying the iPad will be supported at launch. "Sorry, even though I have an iPad and not an iPhone, I always call iOS apps 'iPhone apps,'" she wrote. "I'm sure it's something to do with conditioning." The inclusion of an iPad application would be particularly noteworthy because Google does not currently offer a version of its Google+ software specifically written for Android 3.0 Honeycomb, the search giant's own tablet-only operating system that powers devices like the Motorola Xoom and new Galaxy Tab 10.1. Those who own an Android-based tablet running Honeycomb can install the official Google+ application on their device, but it is not optimized for the larger screen sizes. One report characterized the current experience of Google+ on Honeycomb as "awful." The new Google+ service is the company's latest stab at social networking on the Web. It debuted late last month and is currently in an invite-only phase. Google+ has an Apple connection in the form of Andy Hertzfeld, who designed the interface of the "Circles" interface found in the new project. Hertzfeld was instrumental in creating the original graphical user interface of the Macintosh after joining Apple in 1979. Google's products are usually known for their spartan interfaces, but Google+ offers an animated design that includes the Circles social grouping feature. 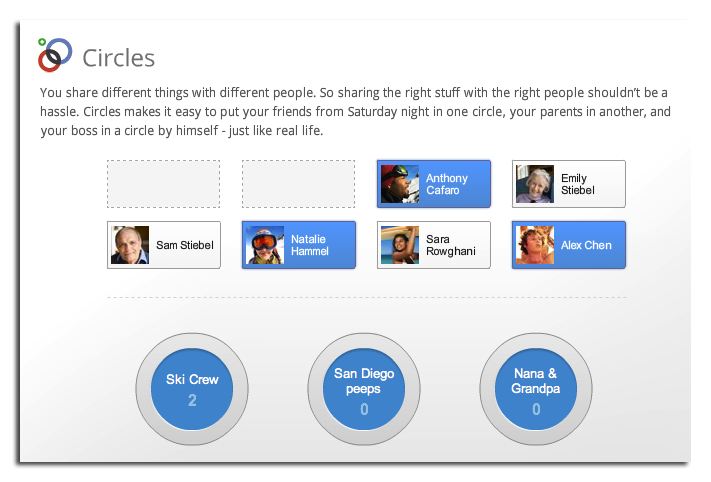 Using Circles, users can drag and drop their friends into groups, making it easy to share certain information with specific groups of friends on the Google+ service. No additional details of the forthcoming iOS software were provided by Joy this week, leaving it unknown what elements of the animated user interface, such as the Circles feature, would be ported to the iPhone. Google+ on Android includes Circles as well as Stream, Photos, Profile and "Huddle" for group chat.